f a l l 2 0 1 4 | W e s t W o r l d A l b e r t A 5 familiar towing services most people associ- ate with AMA. Starting on p. 53, you'll learn more about that value, including a few stories from some of the incredible partners that we're adding to what is already a pretty impressive lineup. We recognize that a rewards program is more valuable when you have opportunities every single day to collect reward dollars or save money on purchases. at's why, this year, we've been expanding our program to include companies you already do business with here in Alberta – to ensure that the program is as relevant in your own backyard as it is away from home. It's remarkable just how easy it is to pay for your membership, a trip or other services, just by doing what you're already doing today – buying grocer- ies, filling up with gas, getting a coffee or an oil change. We've been working to make AMA mem- bership meaningful and to help protect the things our members care about most. Now we're creating even more value for you, right here at home. I hope you'll see that value for yourself, soon. ank you for being a part of our family. T here are members who have been part of our association for decades. Occasionally, they reach out to explain why. For instance, this summer, member Anne shared with us that she gets more out of belonging to our AMA family than just peace of mind: "e membership is like insur- ance in case something goes wrong with my car mechanically, but it's more than that. I use my membership as a rewards card. 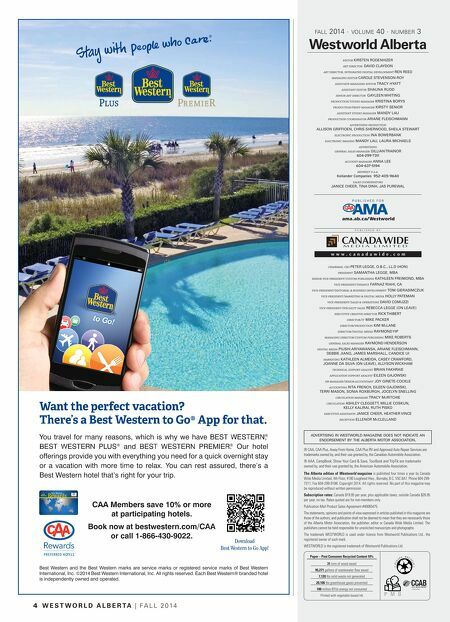 A mem- bership costs less than if we were to use a credit card with a points program. And we rely on it for discounts when we travel, too, because it's recognized everywhere." Stephen, a young student from Edmonton, joined AMA when he moved out on his own because, as he put it, he felt safer with his membership: "AMA is like family – I can call on them for help if I need it." Everyone has their own reason for being a part of our family. I'd love to hear yours – you can email me at don@ama.ab.ca. I also thought, as we get close to reaching the one- million-member mark, that it was a good time to reflect on some incredible reasons you may not have considered. 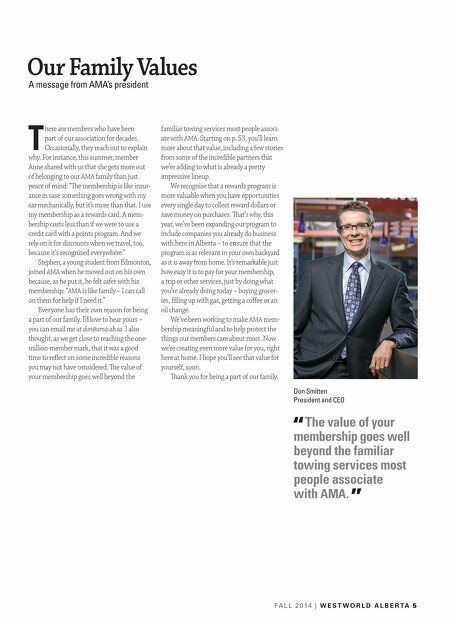 e value of your membership goes well beyond the Our Family Values A message from AMA's president Don Smitten President and CEO The value of your membership goes well beyond the familiar towing services most people associate with AMA. " "